Hi guys! I'm new here, and this is my first post. I've been browsing the forums for a while now, and it got me excited about TTM autograph collecting. I've sent out 12 requests so far, and 2 have came back, both successfully (Nika Futterman: signed my 2 4x6's plus hand written letter, Carrie Fisher: signed my index card and sent a signed 8x10). I also wanted to say that I sent requests to Matt Lanter and Catherine Taber with your guys' addresses, and the both came back return to sender. I was also wondering if you guys knew san address for Kate Capshaw and/or an address for Natalie Portman. Hopefully I don't offend the very few people that actually make the occasional post here every couple of months, but if you would really like to get into the hobby, I recommend two alternatives. You probably wouldn't have gotten a reply for quite awhile had I not coincidentally decided to check in on this forum today. 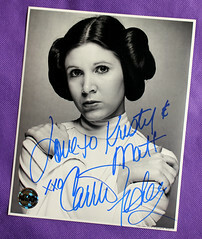 Firstly, I actually just created a site of my own last week that is dedicated to Star Wars autograph collecting. At the site, you will find an address database with well over a hundred listings for people involved with Star Wars and hundreds more to come. I hope you will consider joining. I would be more than happy to help you with questions about the hobby in the forums on my site. The second resource is the forums on a site called Rebelscum. In the autograph collecting forum of that website, there is a great deal of information posted on a daily basis by folks like myself who have been collecting for many years. You might find the information there a good resource. I will give you a bit of important advice right off the bat, and tell you that most of the "bigger" cast members from the movies (ie. Natalie Portman, Liam Neeson, Samuel L. Jackson, Mark Hamill, Harrison Ford, etc.) simply do not sign autographs through the mail. Most of their autographs go for over $100. I know it can sound a little discouraging at first, but trust me when I say that it is still a very rewarding and fun hobby once you slightly lower your expectations. If you are interested in knowing more, feel free to keep in touch with me on my website via either the forums or contact page. I can't say how often I'll be checking in on these forums. Welcome to the site, and congrats on your successes! If you have any questions or want to check if an address is up to date just post in the person's thread and I'll let you know. I check in pretty much every other day, I just don't login unless there's new posts to reply to. Thanks! Yeah, I was a little disappointed when I learned that some of my favorite actors/actresses in Star Wars and other movies don't even sign TTM, and I don't really want to fork over the ton of money for theirs. Oh, and thanks SWfan for the addresses- I found some others, but I'll definitely try those if the ones I found don't work. I've been using fanmail.biz for most of my addresses, but there are some that I just can't find anywhere, like the one I mentioned on my first post. Thanks again for all the help! Hi, welcome to the site. Yeah, as Chewie said, a lot of the addresses on the site are now a little old. I haven't been active in ttm collecting in a while now....at one point in time I'd pretty much tried all the ttm Star Wars signers at the time...and was running in to a lot of dead ends. As you probably already know, the key to successful requesting is finding valid addresses. The best way to do through websites with a lot of active particiapation. The more current feedback there is on addresses, the better you can gauge your success rate. Definitely check our Chewie's site, and the Rebelscum forums. Back in the day I also used Wattographs Star Wars address database, and had a membership to StarTiger...a pay address database, with thousands of addresses. Back then Star Tiger didn't always have a lot of participation on the SW actors...but that may have changed now. And if a pay site if too pricey, you might go in on it with someone. At one point three of us shared an account, bringing the costs down to about $10 a person. I use startiger for addresses. IMO it's the best address site out there. And it's only $5 a month. Nice. It used to cost a lot more. Thanks again guys, for the help! I may sign up for Startiger in the future, but most of the addresses I've been able to find are on fanmail.biz. I'm just hoping some of my requests come back soon... I'm getting a little tired of going to the mailbox and not finding anything. Also, I believe my Carrie Fisher auto is probably secretarial. Everyone who sent requests to that address got back photos that were all signed differently, including mine. Oh, well. I didn't really know anything about TTM that I do now when I sent it. I got a secretarial from her years ago. Back then it was distinctly different from her real signature...and soon thereafter she started doing private signings and conventions again. Also, I have a couple of IP autographs that I've collected. I have Ashley Eckstein, Dee Bradley Baker, and James Arnold Taylor that I collected at Star Wars Weekends this year, and another from Ashley Eckstein when she was visiting the Orlando Science Center for the Star Wars Exhibit. Very cool. I've met all the Clone Wars poeple at a con before...they're all really awesome people. I'm going to have to wait on judgement for the Carrie Fisher, but they look secretarial to me. The old secretarials were way different. These look like someone trying to match her signature...which is probably what secretarials should look like. My main reason for thinking this is, in my experience...she consistently writes her C large, so it is as tall as the F. In yours it is much smaller. Anyway, that is my opinion, based on looking at a signature I have, and other autehntic sigs online. Below is an example of a sharpie signature that should be authentic. And here is a pen signature, from a check date unknown. People's signatures evolve with time, and since checks aren't really returned anymore, I'm going with older. 70s-90s. The Carrie looks like a secretarial.. Sorry. Congrats on your other ones though! Good Luck! You should get replies from Tom, Catherine, Matt, Karen, John and maybe Jim, plus preprints from Harrison and Mark. Peter won't sign TTM for free, but you can buy his autograph from his website though. http://www.wookieewarehouse.com The rest of them... you probably have a 1% chance of getting a reply..
Yeah... I thought it might be worth a try, though... I hope I at least get my three topps cards I sent to Jake Lloyd back. I'm pretty excited to get back Karen and John. I also looked at Peter Mayhew's site, I may buy one sometime. Yeah, autographs are pretty much Peter's only source of income, so he doesnt' sign for free unless it is some sort of charity benefit. I got these back from the Harrison Ford address Saturday. I was surprised how fast it came back- it only took eleven days! The big Indy pic is really cool, although I thought it was a little odd they didn't have any Han photos. Who knows? Maybe I sounded like huge Indiana Jones fan.